This is from Discovering Geometry. Reduce the literacy demand. Let’s encode as much of the text as we can in a visual. Lower the floor on the task. The problem as written jumps straight to the task of calculation. We can scaffold our way to the calculation with some interesting concrete tasks. Add intuition. Guessing is one of those lower-floor tasks and this problem is ready for it. Add modeling. We’ll ask students “what information would be useful here?” before we give them that information. That’s because the first job of modeling (as it’s defined by the CCSS) is “identifying variables in the situation and selecting those that represent essential features.” The task as written does that job for students. Create a better answer key. Once we’ve committed to a visual representation of the task, it’ll satisfy nobody to read the answer in the back of the book. They’ll want to watch the answer. Here’s the three-act page. Leave a response to see the entire lesson. Show this video to students. Ask them to write down a guess: will the sauce overflow? Ask them to guess how many meatballs it’ll take. Guess guess guess. It’s the cheapest, easiest thing I can do to get students interested in an answer and also bring them into the world of the task. Ask them what information would be useful to know and how they would get it. Have them chat in groups about what’s important. If they come back at you telling you they want the radius of the pot and the radius of the meatballs, push on that. Ask them how they’d get the radius. That’s tough. Is there an easier dimension to get? Give them the information you have. Let them struggle with it enough to realize what kind of help they’ll need. Then help them with the formula for cylinder and sphere volume. Do some worked examples. Once they have their mathematical answer, have them recontextualize it. What are the units? If that lip matters, how many meatballs will it matter? Should you adjust your answer up or down? Then show them the answer. Surprisingly close. The student who decided to add a couple of meatballs to her total on account of that lip is now looking really sharp. Let’s not assume students are now fluent with these volume operations. Give them a pile of practice tasks next. Your textbook probably has a large set of them already written. Raise the ceiling on the task. My usual strategy of swapping the knowns and unknowns to create an extension task is failing me here. Watch what that looks like: “The chef adds 50 meatballs to a different pot and it overflows. Tell me about that pot and its sauce level.” I’m not proud of myself. Can you find me a better extension? I’ll give highest marks to extensions that build on the context we’ve already worked to set up (ie. don’t go running off to bowling balls and swimming pools) and that further develop the concept of volume of spheres and cylinders (ie. don’t go running off to cubes or frustums). Andrew Shauver also turns to video but (inadvertently, I think) makes the problem much harder. Beth Ferguson switches to a live demonstration and posts a great list of scaffolding questions. Max Ray, Michelle Parker, and Terry Johanson are all inside my head. Ignacio Mancera poses a similar situation but suggests doing it live in the classroom. I don’t accept the premise that “real” always beats “digital” – there are costs and benefits to consider – but I think Ignacio and Beth have the right plan here. If you have the materials, do it their way. Scott McDaniel suggests changing the context from meatballs in sauce to ice cubes in an iced mocha because kids drink iced coffee but don’t make spaghetti. This introduces a pile of complications (like the non-spherical shape of the ice cubes and the non-cylindrical shape of the cup and the fact that the ice will float at the top of the cup) for unclear benefits. Time and again in this series I’ve tried to convince you that changing the context of a task does very little compared to the changes we can make to the task’s DNA. Does someone (Scott?) want to make the case that the following task is a significant improvement over the original? It puts my Trasketball lesson ( http://www.101qs.com/2008 ) to shame. And I’m not suggesting Trashketball be the extension of Meatballs. 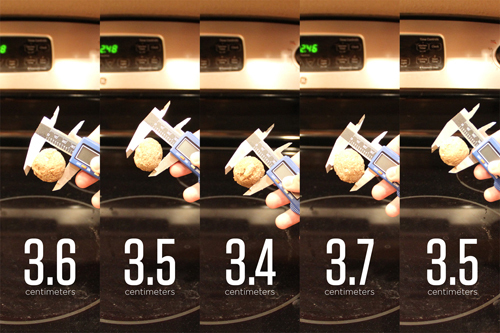 1) Say each meatball absorbs a certain percentage of sauce depending on its volume. How would this affect the amount of sauce and meatballs one can fit in the current pot? 2) Say you’re not done making your dinner and would love to add green peas to your sauce. You like just the right amount of peas to meatballs ratio and you need enough space in the pot to stir this mixture together. Find that ratio. The averaging of the meatballs is a nice touch as well as the lip. I don’t think it really matters whether they figure out what to do with the lip, just that they notice it will produce a little extra volume. Here is a revision with quite a lot of extensions. Tough to convey volume in 2D (paper or video), so an actual demonstration might be better. But, here is a simulation: http://www.geogebratube.org/student/m43698. I believe the simulation is fairly accurate. If practical, I agree with withholding information at first. Also would prefer a labeled diagram or grid instead of bunch of verbiage. The visual for the original is not helpful – not to scale & doesn’t really give any intuition. I would like to see more problems that differentiate within the problem with respect to difficulty. Not sure the context gets me anything in this case & costs me some nice extensions, so I skipped it. I am a second grade teacher and am totally hooked on your makeover series. Even though the problems are not for second graders, reading about how you take something and modify it to make it better has taught me so much. Your blog manages to strike an inspiring balance between theory and direct practical examples for authentic student engagement. Thank you! I want to take back by iced coffee idea. I had originally envisioned a video of a hot cappuccino vs ice cappuccino and which contained the most coffee, the most caffeine, etc. Some of the details and natural intuition would have been obfuscated by the glass and ice cube shapes and their associated volume formulas. I am really enamorred, however, with the simplicity of your activity. I’ll definitely try to use it next term. Is it killing you not being able to use these 3acts on real students? I’m teaching the equivalent of algebra 1 at the college level next term and will attempt to integrate at least 4 of these 3-act activities. Thanks for all the work and outreach. My kitchen has a bunch of different sized pots. Which size pot should I use to reheat the leftovers for myself tomorrow? How big a meatball party could I throw with my largest pot before I had to cook in batches? To answer that, you’d have to figure out how many people these meatballs serve. If I made the meatballs just a little bit smaller, would everybody want an extra meatball, or could I be cheap and save on meat that way? Meat is more expensive than sauce for the same volume, isn’t it? In short, is this a good size for a meatball? Do I have the right ratio of meatballs to sauce, or I am I going to end up with dry meatballs or leftover meatballless sauce? Why are Swedish meatballs so tiny? How does IKEA package takeout meatballs? I am going to try the following approach based on your video: I will open the pack with meat balls, add them to the sauce and show that it spills over. The question to students is simple: how many meatball’s could the pan take? Because: this way it’s obvious for students that there is a *real* problem to solve. James Cleveland’s extension was the first that came to mind for me. Hi Courtney, thanks for the feedback. I’m really underequipped when it comes to helping elementary educators so I’m always grateful to find I haven’t scared all of you off. If you ever felt like sharing how you adapt these tasks or this kind of pedagogy for little kids, you’d be increasing my knowledge base by a lot. Lots of meat from Chris Hunter too, not just with a makeover of his own, but with an expansion on the digital v. real thing. He identifies tasks that no one should want to reproduce it. (I think of Andrew Stadel papering over a file cabinet with 700 Post-It notes.) That’s one circumstance where video > real. There’s also moments like my basketball strobe task where the human eye can’t reproduce what you need for the analysis. Or tasks involving something amazing but far away, like the London Eye ferris wheel. There are times when it’d be too expensive to provide everyone with the same materials. (ie. Everyone gets their own glassware for You Pour, I Choose.) And times where having the material would allow for different mathematical analysis than what you’re targeting. ie. When you have the physical Orbeez and the water jar in front of you, you can solve the overflow question proportionally, without resorting to cylinder or sphere volume at all. When I frame my video just-so and only give you diameter and radius, I’m able to target the concepts I want. I’m curious. What’s the target grade level for this activity? I wasn’t familiar with the Discovering Geometry text. I went out and read a bit about it. I take it that the method of the text is primarily inductive, not deductive. Proof seems to come as an afterthought. The result, I would think, is that geometry becomes just a loose collection of facts. Deduction establishes the connections between them, and with limited deduction, there is limited connection. I don’t think I’d do this activity – either pre- or post-fix – in my classroom. No matter how it’s presented (and your presentation is really very good), it’s still just a plug-numbers-into-a-formula kind. A much better task for a high school classroom is to systematically derive the relevant volume formulae from the volume definitions and postulates. This would be an opportunity to present Archimedes derivation of the sphere area formula. It’s a real beauty – one of the high points of the entire year. I really look forward to it. Another point: I would think that, by the time high school students reach a geometry classroom, we should expect them to largely abstract away from the particulars of such things as pots and meatballs. The applications of the results – a pot is a cylinder, a meatball is a sphere and thus have volumes given by the relevant formulae – don’t need much (if any) time. I think for an extension it would be fun to play with how the volume of a sphere increases as its radius does, so you could ask what the diameter (or circumference or radius) of one meatball that makes the pot overflow all on its own is. Or if you double the cirumcumference, how many can it hold? etc. How much overflows with one too many meatballs? Same meatball recipe (ingredient amount) but change size of meatballs. How many would it make? Is there a size of meatball that will make them all fit? Two comments here. First, I’m surprised no one has cried “Foul!” in regards to pseduocontext here. Just picture it: cook makes meatballs and sauce. Before pouring meatballs into sauce, cook performs calculation to determine if the pot will spill over when he adds meatballs. Really? That being said, I think it’s a neat task that provides students with opportunities to apply some good math reasoning. 1. 2-inch meatballs, sauce 2 inches from the top. 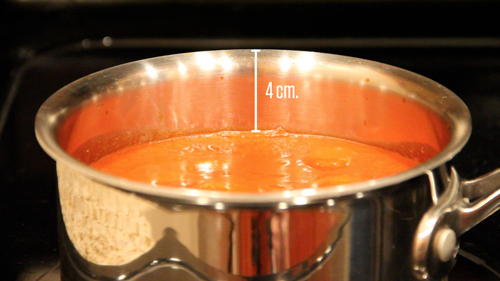 If it takes 20 meatballs for the sauce to reach the brim, how wide is the pot? 2. 2-inch meatballs, 20 of ’em. 14-inch pot. Sauce at top. How high was the sauce before the meatballs were added? 3. 20 meatballs. 14-inch pot. Sauce 2 inches from the top. Add meatballs; pot full. How big are the meatballs? 4. 2-inch meatballs. Sauce 2 from top. Pot 14. How many meatballs till sauce reaches top? Possible extension: The meat lover likes the ratio of sauce to meatballs flipped. How much sauce and how many meatballs would they need? Thanks for doing these makeovers. They make it easy to see how to turn a problem into a 3-acts lesson. I am not sure at what grade level this would apply but it might be worthwhile to nail down the idea of conservation of mass or volume in this case. After the extension of “how many meatballs would over flow it?”, it would be good to ask what would happen if you cut the meat balls into smaller pieces? Would that change the result? I like this as a way of deciding between digital and real when both options exist: “And times where having the material would allow for different mathematical analysis than what you’re targeting.” I’ve seen this with your stacking cups task. I tried it with a group of new teachers. I was concerned that they’d solve it in seconds, instantly recognizing it as application of linear functions. Some did, but many solved it using, you guessed it, proportions. I guess the follow up question a teacher deciding between video and real is “How important is it that students apply the targeted concepts in this particular task?” With the meatball task, I’d be okay with some students solving the problem using proportions, so long as they all didn’t use this method. Adds to the class discussion. Unless I’m throwing them a curveball, this task probably takes place within a unit on volume, in which case I’ll probably get a whole lot of students using cylinder/sphere volume. To bounce back at you, one advantage of real over digital could be differentiation. Take Andrew Stadel’s Couch Coins (http://mr-stadel.blogspot.ca/2013/02/couch-coins.html). Is watching the coins magically move on the couch more engaging than handing pairs of students a pile of coins? Probably. But it may be helpful to hand out or have students pick different amounts. I was also thinking about how these two might work together. The Orbeez task, sandwiched between the meatball task, could allow for more experimentation of ideas as part of act two. Could this type of approach work or does this detract from act 3? (Loss of momentum/interest?) Timon Piccini pulls this type of thing off beautifully in his Pop Box Design task (http://mrpiccmath.weebly.com/1/post/2012/02/3-acts-pop-box-design.html). I’m not trying to make the case that real > video, here or in general. Rather, I’m interested in the thought process involved when teachers make that decision. This is what makes #MakeoverMonday so interesting to me. Is there something with the ratio of meatballs to sauce in the current pan and enlarging the “order?” I.e. we need more meatballs, how much sauce? What size pan is needed? I agree reversing the variables as is typically the extension isn’t clean or effective in this one. Andrew shauver’s take too long to develop and Beth ferguson s isn’t “open” to student interpretation/exploration. What if the video showed scooping two meatballs (open slotted spoon) and one scoop sauce (with a ladle). Let kids go from there. – how many servings? Basic and too easy. – will there be extra sauce? If yes, how many more meatballs to use all the sauce? Will that fit into the pan? Earlier this year I had my students figure out how many golf balls could fit in a cabinet in the classroom. The biggest challenge was measuring the non-ball spaces in between. 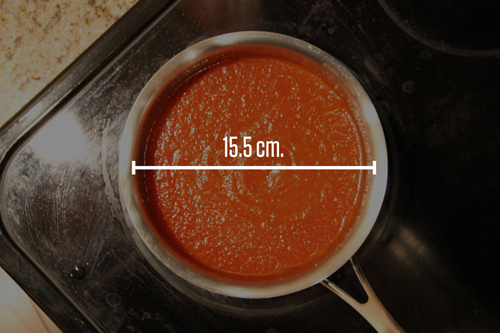 The sauce in this problem would really help them to visualize how much space is not being taken up by meatballs. 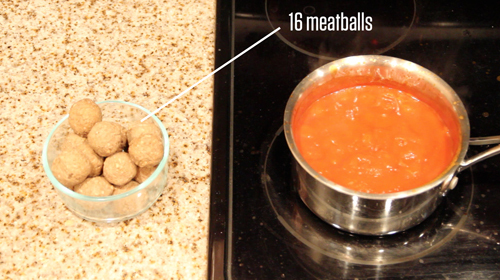 Follow-up question: what would the diameter of a meatball made from two smaller meatballs be? Would combining them change the answer? Of course, it wouldn’t, but understanding that would be a good indication of learning. It turns out that your guests for dinner are allergic to spheres, so you roll out each meatball into a cylinder. Will putting in all two dozen of the meat-cylinders cause the pot to overflow? We’ll quickly get to know something about kids’ understanding of volume. If they can reason (“convince me!”) that it makes no difference, they’ve got a fix on the fundamental notion of volume as the 3-d space filled by meat – isn’t that an interesting part of what the original question is all about? Once it’s understood that we can shape-shift and conserve volume, there’s any number of transforming-volume questions we might ask. They might be interested in the dimensions of other solids they can make with each meatball. Maybe you want to squish the meatball into a patty-style cylinder with the same diameter – 2″. What happens if you stack up these cylinders next to a stack of the meatballs? Thanks for the comment, Franklin. I suppose I’m confused why induction must necessarily result in a disjointed curriculum. Also, it seems difficult for most adults to think deductively, to say nothing of building a curriculum for students around deductively. First, I’m surprised no one has cried “Foul!” in regards to pseduocontext here. Just picture it: cook makes meatballs and sauce. Before pouring meatballs into sauce, cook performs calculation to determine if the pot will spill over when he adds meatballs. Really? Agreed. No cook would ever compute this recipe mathematically. But no basketball player would ever use quadratic equations to calculate whether or not her shot will go in. And yet kids are fairly keen on that task. So I guess I wonder if your definition of pseudocontext needs calibration. So, 36 meatballs caused the overflow. Volume of 36 meatballs (averaging 3.5 cm in diameter) is about 808 cm^3. Now, kids, it would be faster if I could just make bigger meatballs. If I made each meatball twice the diameter, or 7.0 cm, would adding only 18 of these bigger meatballs cause the same overflow then? 1. I wouldn’t make the strong claim that geometry done inductively must result in a disjointed curriculum. But I do believe that that’s the tendency. Here’s an example. If you were to present students with many examples of parallelograms, they’d very soon conclude that opposite sides and angles are congruent. That’s induction. But what if we wanted students to know more than that as a matter of fact opposite angles and sides are congruent? What if we wanted them to know why it’s true? That’s where deduction comes in. A proof of these two properties (and ‘proof’ just is another word for ‘deduction’) derives them from prior results about congruent triangles and parallels. The proof thus forges the connection between the new facts and the old. My view is that the importance of geometry lies in its systematicity. It isn’t just a sequence of facts, loosely connected if at all. It’s a set of results that can be traced back via deduction to a small set of fundamental, intuitively obvious assumptions. Moreover, it’s by linking the new back to the old via deduction that we explain why the new is true. No deduction, no explanation. I’m curious what the classroom sequence looks like here. Because a proof begins with that which is to be proven. So we pose the given (a quadrilateral with opposite sides parallel) and the objective (opposite angles and sides are congruent) and we prove it deductively. But how did we get that place of wanting to prove that objective? Did the teacher just write it on the board at the start of class? I’m just speculating so set me straight. But what my anecdote lacks is any intellectual need from the student for that proof. They’re doing the proof because the teacher suggested it. An inductive approach would let the students notice that, “Hey, waitaminit, all these sides and angles are the same.” Which would then provoke the need to prove why. Thus the inductive can lead to and provoke the need for the deductive. The motive to find the proof of some geometrical theorem or other is internal to the problem. It isn’t that students walked into the classroom with some concrete question in mind (“The wheels on my car are circles. I wonder how many times they had to rotate to get me to school?”) and that we piggyback on that. Instead it’s that they like good puzzles. I don’t know why we human beings are like that, but we are. This is why my first question when I consider what do to in my classroom is always this: Is it a good problem? Will it be fun to look for a solution? I’ll be the first to admit that I don’t always achieve that goal. Sometimes a bit of drill is necessary, and that isn’t much fun. But still, that always the goal. That’s why I’m also a little suspicious when someone continually demands context or application. Taht makes it seem as if students can’t really enjoy the mathematics for its own sake. Now, I’m fine with context and application. I don’t mean to say that we shouldn’t seek them out. Instead I mean to say that for the most part they’re not necessary. The mathematics itself suffices. “Measurement offers a permanent solution to math phobia by introducing us to mathematics as an artful way of thinking and living. In conversational prose that conveys his passion for the subject, Lockhart makes mathematics accessible without oversimplifying. He makes no more attempt to hide the challenge of mathematics than he does to shield us from its beautiful intensity. Favoring plain English and pictures over jargon and formulas, he succeeds in making complex ideas about the mathematics of shape and motion intuitive and graspable. His elegant discussion of mathematical reasoning and themes in classical geometry offers proof of his conviction that mathematics illuminates art as much as science. First (and apologies to Michael Serra who I know reads this blog) let me say Discovering Geometry is kind of meh for teaching deductive reasoning. I taught out of it for four years and deductive reasoning always came off as an afterthought. 1.) Gather data on the problem. 2.) Poke at the data and make inductive guesses. 3.) Test those inductive guesses and generate proofs as necessary. 4.) Build new mathematical structures and make intuitive connections as necessary. Anyhow, if you want to see mathematical thinking exposed for the messy wreck that it is, try one of the Polymath projects (I recommend #5, where a large part of the early work was consumed by just getting the data in a form that looked clear enough we could start thinking of patterns). That’s why I’m also a little suspicious when someone continually demands context or application. That makes it seem as if students can’t really enjoy the mathematics for its own sake. Now, I’m fine with context and application. I don’t mean to say that we shouldn’t seek them out. Instead I mean to say that for the most part they’re not necessary. We talked over here about “organizing principles” for a math class. I’d say “make math real world” is as self-defeating an organizing principle as one can find. “Prioritize perplexity,” on the other hand, lets us chase down curious mathematics wherever it lives, either in the world outside the classroom or in the world of numbers and shapes. While it’s clear to me you prize pure mathematics, it’s less clear to me how you create the experiences around it. Humans like good puzzles, as you say. No disagreement there. But creating those puzzles isn’t a trivial matter. In the example you chose of deducing congruent opposite angles and sides from a parallelogram’s parallel sides, how do you turn that proof into the sort of satisfying puzzle Lockhart writes about, rather than an exercise assigned by a teacher? Okay, I just encountered a real-world application of this problem (or a similar one). If my toilet fills up to the brim because it is clogged, how long do I have to wait/how far down does the water have to go before I can put the plunger in without making it overflow? Just watched part of the orbeez video .. has anyone piped up that it would be great in the “show the answer” and “prove the math” kind of contexts to do this activity or create these videos in a glass measuring cup where you can see the measurements and students can REALLY see the water raise bit by bit. This could be a second video in a set – perhaps it already is; I’m in a coffee shop and am not going to watch through all the videos on mute at the moment. Looks great though! We just talked about this problem and your makeover at Math for America. One idea was to up the stakes: I’m putting this jar of water on top of a student’s phone. How many balls can I put it before it spills over? If you are sure you are right, put your phone under the jar…. Here is a an article with a surprising application forsphere packing . Turns out you can pack with about 74% efficiency (about half way down in the article). What We Can Learn About Learning From Khan Academy’s Source Code, Ctd. The Unengageables, Ctd.